Thank you for biting me, when i tried to catch you. Thank you for welcoming me, when i reach home, looking at me as i opened the door. Thank you for bringing laughters, during that time when your cage was not being closed properly, and thus you ran out, and around the living room. However, it was too sudden, that you just left us like that ! Mood changed when the news was being shared to me. You were still alright, when i went off to work in the morning, right ? 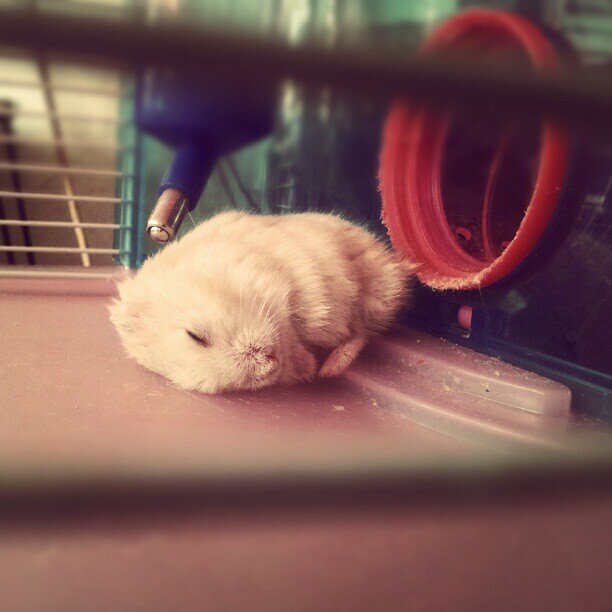 *This photo is taken long ago, when i caught him in a cute sleeping position. I love animals, but dont like the truth that they will die and leave us, someday. Thank you again, Hammy ! condolences to your hammy. i used to hav alot of hammies until they all left me..even my Ronnie has left me. lucky i got faith now. Thank you, Shirley! Yup, hammies life span only about 2 years? What has the society become ?